We have everything you need to fuel the growth of your hotels. Smart Finder offers end-to-end hotel management system solutions helping you facilitate all aspects of your property management, from front office to back office management. Our key hotel software includes a property management system, back office management system, point-of-sale system, interface system, and much more. Each of our hotel software products is seamlessly integrated and will therefore maximize the management capabilities of you and your team. 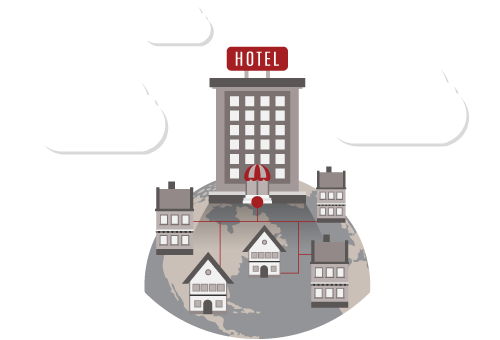 Furthermore, integration with third-party hotel software and hardware will make you an even better hotelier because you can now accomplish much more than ever before. Smart Finder finds only the best hotel software solutions for you, true to our corporate name. Not only will you receive the finest hotel software technology, but you will also be given best-in-class support when you use our services. We help you manage your various hotel properties with greater ease and efficiency. With our multi-property hotel management solution, there are no limits to achieving excellence in hotel management. All information across all properties is consolidated. Tasks can be centralized and the workload reduced. Management can see the whole picture in one place, in real-time. Managing multiple hotel properties could never be easier. We help you, independent hoteliers, to compete in the world’s most competitive industry on an even footing with some of your biggest rivals, with increased management capabilities created through our powerful hotel management software suites. With the full range of robust hotel software deployed at your hotel, you will realize that you could achieve much more, more smoothly, and more effectively, giving you a clear competitive advantage. With our award-winning support team, you can be absolutely worry-free. Our support agents are always ready to support you 24/7/365. They are super responsive and eager to help you with anything. Various support channels are also provided for your preferences, including call center, email, LINE App, and onsite support. You will be impressed by just how good our dedicated customer service is, unlike any other. The Smart Finder Property Management System helps you manage your hotel more efficiently and effectively. It streamlines front office operations as well as facilitating flows of hotel operational processes. You can save time and reduce unnecessary costs by automating repetitive tasks and setting your staff free to better serve your guests. You can also reduce those limitations in your hotel front office management, unlocking your hidden potential to become a better hotelier. Our Point-of-Sale System is specifically designed for the hotel business. It lets you effectively manage many different outlets in your hotels including restaurants, coffee shops, bars, shops, or even spas. Handling sales of different items is also super easy. Moreover, the Smart Finder Point-of-Sale System also interfaces with our Property Management System and Back Office Management System, which helps automate your hotel’s operational processes. With automation in place, you can work more efficiently. We help create and design your hotel’s website according to your requirements. With our website service, you can energize your hotel’s online marketing through your own powerful website that includes a complete set of online marketing tools including SEO, social media connections, booking buttons, a multi-language switcher, and many other features. Increase operational mobility to hotel and restaurant businesses with the GetVZA Mobile Hospitality App. You can complete various tasks from anywhere, be it guest check-ins/outs, making reservations, updating room status, item posting, billing, and much more. Your productivity is improved as your work can be done easily and rapidly. The GetVZA Mobile Hospitality App is also integrated with our Property Management System and Point-of-Sale System for seamless hotel and restaurant operations. We provide multiple interface options with both our own systems and third-party systems. For example, our channel management system, property management system, telephone system, door locking system, passport/ID card reader, payment gateway, and much more. 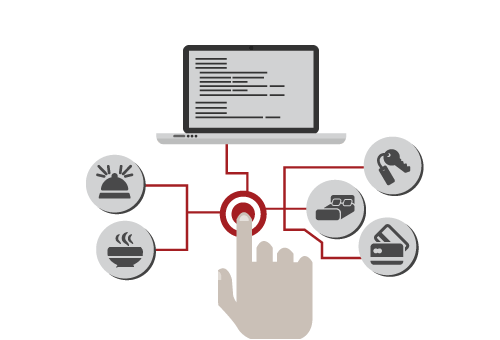 With our interfaces, you can manage different things from system to system more easily, conveniently, and seamlessly. You can also eliminate repetitive and unnecessary tasks, thereby saving you even more time. We help design and install network infrastructure which is optimized for maximum performance in the real working physical environment. Plus, you can save more of your valuable time by outsourcing hardware procurement to us. Manage your hotel finances easily, accurately, and efficiently by taking control of your accounting such as accounts receivable, accounts payable, general ledgers, inventory, income statements, and other financial information. Integration with your property management system and point-of-sale system means you no longer have to perform manual entries to register the transactions incurred across the different outlets in your hotels. Let the system automate these processes for you while you focus your attention on more valuable matters. The Smart Finder Central Reservation System allows you to manage the reservations of multiple properties in one place. It organizes the reservations data of each property making it easy to manage. It lets you control reservations from different channels for all the properties in your hotel chain in a much more efficient manner. Plus, you can push your hotels’ costs down by centralizing the reservations team. All reservations at all your multiple properties can be managed by a single team, no matter how many properties you have, by making the best of your human resources. Simply place your own booking button anywhere online and let guests book your hotels directly via your own online distribution channels, such as your hotel website, social media, and so on. With built-in promotion tools, you can offer additional services or sales promotions to generate more revenue per booking with up-selling and cross-selling campaigns. Once done booking, guests can pay right away through the online payment gateway embedded in the system. With PMS interface, reservation information can go directly to the Property Management System to create new bookings in real-time. Add value to your business by letting your customers interact with your services directly via their mobile devices using the GetVZA Guest Service App. For example, they can make reservations, order items, or even make payments instantly by themselves. The more autonomy guests have, the better the experience they receive. The GetVZA Guest Service App is also integrated with our Property Management System and Point-of-Sale System for seamless hotel and restaurant operations. No business is the same in terms of operations. If you want a hotel software solution that perfectly fits your business, we can make it for you. With our customization service, you can have your own tailor-made hotel software customized exactly the way you want it to work.